In a “more is more” 16 oz. spa size, this generous, convenient pump jar lets you enjoy the best in skincare at a fraction of the cost. Ultra-hydrating complex helps reduce the appearance of wrinkles while tightening problem areas and Illuminating your complexion. Compare at $60! Water, Mineral Oil, Glyceryl Stearate SE, Cetearyl Alcohol, Aloe Barbadensis Leaf Juice, Butylene Glycol, Glycerin, Isopropyl Myristate, Ceteareth-20, Caprylic/Capric Triglyceride, Argania Spinosa Kernel Oil, Camellia Sinensis Leaf Extract, Anthemis Nobilis Flower Extract, Hydrolyzed Collagen, Acrylates/C10-30 Alkyl Acrylate Crosspolymer, Disodium EDTA, Citric Acid, Triethanolamine, Iodopropynyl Butylcarbamate, DMDM Hydantoin, Phenoxyethanol, Fragrance. 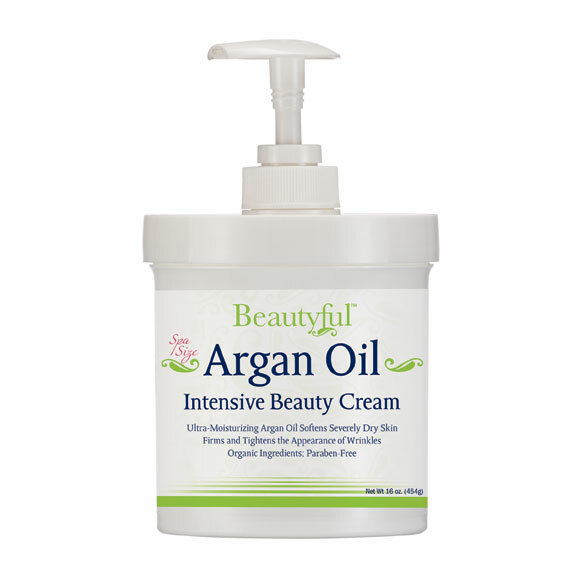 The Argan Oil is healthy for the skin and also it will help with the wrinkles and dry skin. To reduce the appearance of neck wrinkles. I need to use a face cream to enlighten my skin tone and make my face brighter and younger looking. Seemed like a good purchase price-wise.